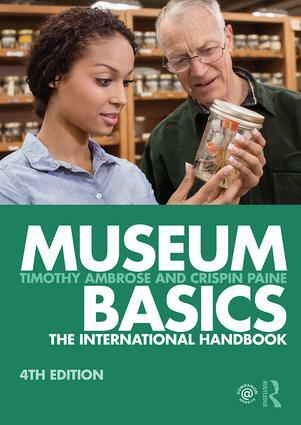 This fourth edition of Museum Basics has been produced for use in the many museums worldwide that operate with few professional staff and limited resources. The fourth edition has been fully updated to reflect the many changes that have taken place in museums around the world over the last six years. Drawing from a wide range of practical experience, the authors provide a basic guide to all aspects of museum work, from audience development and learning, through collections management and conservation, to museum management and forward planning. Museum Basics is organised on a modular basis, with over 100 units in eight sections. It can be used both as a reference work to assist day-to-day museum management, and as the key textbook for pre-service and in-service museum training programmes, where it can be supplemented by case studies, project work and group discussion. This edition includes over 100 diagrams to support the text, as well as a glossary, sources of information and support and a select bibliography. Museum Basics is also supported by its own companion website, which provides a wide range of additional resources for readers. Museum Basics aims to help the museum practitioner keep up to date with new thinking about the function of museums and their relationships with the communities they serve. The training materials provided within the book are also suitable for pre-service and in-service students who wish to gain a full understanding of work in a museum. Timothy Ambrose is an international consultant working in the field of museums and cultural heritage. He is a Fellow of the Society of Antiquaries of London and a Fellow of the Museums Association. He has a particular interest in the role of museums in destination development and has published widely on museums and cultural heritage issues. Crispin Paine is a former curator and museum consultant, now an author and museum volunteer. He is a Fellow of the Society of Antiquaries of London and a Fellow of the Museums Association. He has particular interests in local community museums and in the material culture of religion.